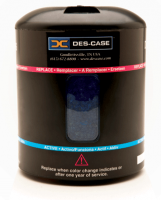 Desiccant Breathers:The first line of defence against contamination. 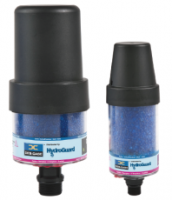 Desiccant breathers are a vital step in contamination control. Studies have shown 50 to 70 percent of lubricant contamination can come from outside that equipment. 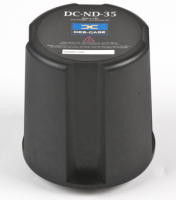 As most machines are designed to "breath" protecting the source of air flow from moisture particulate contamination is extremely valuable for front end protection and reliability optimization. 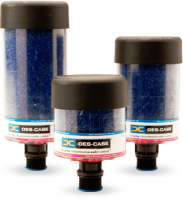 Des-Case desiccant breathers incorporate a high capture efficiency filter to help sustain desired cleanliness levels by removing even minute particulate matter. They also create low relative humidity levels in the headspace, making condensation and absorption by the lubricant unlikely. 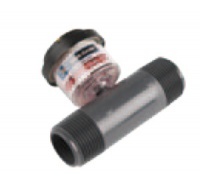 When a system is properly fitted with a breather containing drying and filtration media, contamination ingression is greatly reduced.